Kemiko Stone Tone Stain transforms an ordinary concrete slab into a luxurious floor that resembles marble or glazed stone. 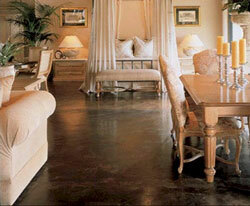 When concrete is stained and scored Kemiko creates the appearance of expensive flooring at a fraction of the cost. Unlike paint, Kemiko Stone Tone Stain reacts with the minerals present in the concrete giving it the look and feel of natural stone. Each concrete slab accepts the stain in varying degrees of intensity creating stunning, multi-hued color variations and an uneven surface that looks perfectly aged. Whether working with a neo-classic, Southwestern, eclectic, or strictly traditional decor, Kemiko adapts to enhance any setting. The Kemiko process surpasses all others in terms of permanence and durability. It will not chip, fade, or peel, and will last the lifetime of the surface to which it is applied. Those suffering from allergies find concrete staining especially appealing and a welcomed change from deep pile carpeting. Kemiko Stone Tone Stain is virtually maintenance free for a carefree lifestyle-simply damp mop as needed. Available in eight colors, Kemiko Stone Tone Stain is the perfect choice for both interior and exterior surfaces. Often used for commercial purposes, concrete staining lends a clean, attractive look to driveways, patios, walkways and entrances. It is perfect for high-traffic areas and is very affordable. client in creating beautiful, durable, and affordable stained concrete projects.